30 January 2019, Dubai United Arab Emirates: Water and Electricity Company LLC (WEC), the Saudi Arabia state-owned company in charge of desalination and water treatment projects, has awarded ACCIONA — along with its consortium partners Marubeni Corporation, Abdul Latif Jameel-CDC and Rawafid Alhadarah Holding Co. — the contract to finance, design and build the new Shuqaiq 3 desalination plant and operate and maintain it for 25 years. This project, ACCIONA Agua's biggest so far in Saudi Arabia, will be implemented under a BOO (build, own and operate) contract amounting approx. 500million euros. ACCIONA Agua will be involved throughout the project structure: as an investor, sole EPC (turnkey) contractor, and leading and majority partner in operation and maintenance. In addition to its considerable experience in major desalination projects worldwide, ACCIONA was chosen due to having offered a desalinated water price of 0.52 USD per cubic metre, among the cheapest rates anywhere in the world. Located in the country's south west, on the shores of the Red Sea, and scheduled for completion in 2021, Shuqaiq 3 will be one of Saudi Arabia's biggest desalination plants, using inverse osmosis technology and with a capacity to process 450,000 cubic metres per day, to cater for a population of 2 million people. It will also incorporate a solar photovoltaic facility to reduce its specific power consumption. As part of the project's social outreach measures, in the first few years the consortium will offer academic and practical training to residents of the area in order to nurture the development of water industry professionals in a region so in need of projects of this kind. This project, which offers one of the world's lowest rates for desalinated water, is part of Saudi Arabia's plan to transform and modernise its water industry by renovating its fresh water production facilities, adapting them to modern international quality and efficiency standards. This is ACCIONA's third desalination plant in Saudi Arabia, enabling the company to provide some 3 million people with water. In July 2018, ACCIONA Agua won the contract to build the Al–Khobar 1 desalination plant, in Al-Khobar, on the country's east coast, about 400 kilometres from Riyadh. 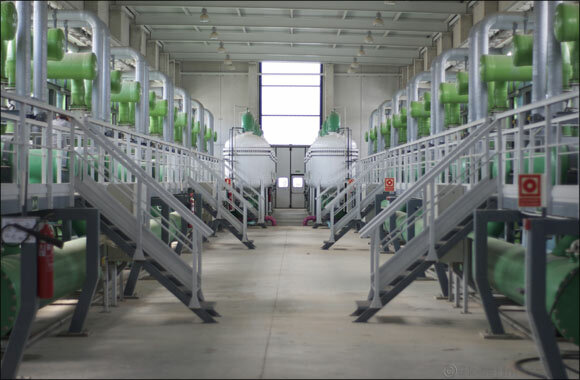 This turnkey project, with a one-year warranty, is valued at more than 200 million euros and is the first project of this kind to be commissioned by government corporation Saline Water Conversion Corporation (SWCC) from a Spanish company. The facility will have a capacity of almost cubic metres per day, to serve a population of 350,000. The plant will also supply water to Aramco, the world's largest oil company. In 2012 ACCIONA was awarded the contract to design, build and commission the Al Jubail seawater desalination plant, which since 2015 serves both the city and the industrial complex in the country's Eastern Province, on the Persian Gulf coast.